Whether you are writing thank you notes or making beautiful music notes, we’ve got something special and unique for your home. These musical wonders will put a song in your heart and a melody in your ear. Make one of these ♫ Noteworthy Finds ♫ an early Christmas present for yourself! This incredibly fabulous piece is made of Brazilian Rosewood with octagonal tapering legs and 85 ebony & ivory keys. Jonas Chickering was the first piano manufacturer in America, established in 1823. This piano is in beautiful condition and overall, it is in amazingly clean, beautiful condition. Sure to be an conversation piece in any home as well as a source of beautiful music by anyone playing it. Yes this unique desk is the only one like it in the world. This is a Victorian Organ converted into a gorgeous writing or computer desk. Solid Walnut. Circa 1870. Measures: 22″D x 50″W x 44″H. Carved to death, pigeonholing, music book holder that lifts to reveal another storage compartment, candle holders, writing surface 28″H. This is from a very fine, eclectic, non-smoking, estate in the base of the north Georgia Mountains. We have multiple mantles and other pieces from this very estate. Great Stuff! This unique desk, great for computer or writing. Only one like it in the world. 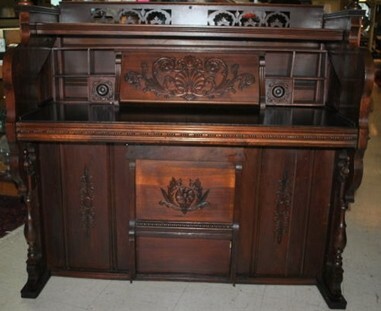 Eastlake style Victorian organ converted into desk in solid walnut, circa 1870. Too Cool!! Measures: 22″D x 41″W x 70.5″H. Carved to death, mirror, candle holder (one is missing), 2 shelves, writing surface 28.5″H. Good, very clean, sturdy condition. Mirror is very aged.